Cumbernauld United suffered a disappointing loss to Super League First Division joint leaders Cambuslang Rangers at Guy’s Meadow. Despite being the more dominant side for long periods, poor finishing and deficiencies in defence combined to leave the home team pointless. United began well and Robbie Winters came near to scoring, connecting to a Scott Murphy free-kick only to see his effort go narrowly past. A Paddy McCabe header from a Winters cross cleared the bar before Cambuslang, against the run of play, took the lead in the 35th minute. An United attack broke down when Rangers’ Jordan Halsman sent a long clearance upfield. The bounce of the ball eluded the home defence and striker Calum McRobbie got to the ball before United keeper Jordan Brown to put the visitors ahead. Good play from McCabe and Winters almost saw them get through the Cambuslang defence but a fortunate block spoiled yet another chance. Just before half-time the league leaders increased their advantage when a cross from the wing was directed beyond Brown and off the post by the ever alert McRobbie. After the interval a fine pass from Dylan McGuigan set up Jamie Watson whose effort went wide before another attempt by Watson was well saved by visiting goalkeeper Ian Stewart. A Tony Stevenson rocket then brought out a magnificent one-handed stop from Stewart before Watson outpaced the Cambuslang defence but shot wide. United manager Andy Frame brought on three substitutes as the contest neared the end but it was the visitors who, in the 85th minute scored a third and decisive goal. Substitute Thomas Kilmartin latched on to a long ball upfield to advance and shoot past Brown. 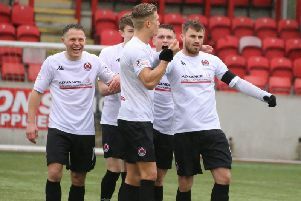 A minute later the home men got a consolation counter when substitute Mikey McLaughlin’s great cross found Winters at the back post and the experienced striker headed an excellent goal.